Wish to define your eyes? Try Himalaya Kajal herbal eye definer. It’s a gentle blend of herbs like almond oil, castor oil, camphor and Triphala that makes your eyes look fresh and bright. It also has Damask rose that cools your eyes. Himalaya Kajal herbal eyeliner thus brings out the best in your eyes Naturally! 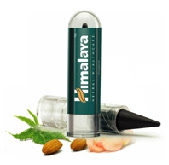 Almond oil (Vatada, Prunus amygdalus) -- nourishing for the lashes, anti-ageing effect on eyelids. Camphor (Karpura, Cinnamomum camphora) -- helps in lacrimation - keeps eyes moistened. Castor oil (Eranda, Ricinus communis) -- is an emollient (skin-softner) and acts as a protective barrier between the skin and outside harsh environmental conditions of wind, dust and dry air. Damask Rose (Shatapatri, Rosa damascena) -- Cooling and helps to overcome the eyestrain. Triphala (a unique herbal composite of three power-packed berries namely Amalaki, Haritaki, Vibhitaki fruits -- Emblica officinalis, Terminalia chebula, Terminalia bellerica) is a well-know anti-inflammatory eye tonic which reduces eye redness and swelling and imparts luster to the eyes making them look bright and attractive. This looks great! Thank you for the info. If you want to make the appearance that you have big eyes, apply to under-eye. First do it from the outer bottom corner to the middle of that lower section. Use a very black or a brownish black color. Then, smear or smudge it with clean fingers, a small brush and is really effective. If you do the top lid with your eyes closed, it will screw it up major, by making the line way up high.